50 Plus News Magazine is a family-owned business dedicated to providing well-written, useful information of interest to people 50 and over and their families. The company was founded in 1992 by publisher Maureen Slattery and her husband Tom, the associate publisher. Free monthly print editions of the 50 Plus News Magazine cover the Greater Milwaukee area including distribution in Waukesha, Washington and Ozaukee counties. 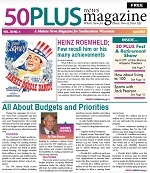 50 Plus News Magazine’s award-winning content covers health, financial, career, housing, travel and arts topics, as well as local events and feature stories. Readers of our editions pick up more than 45,000 copies each month at more than 345 distribution sites. We also mail copies to subscribers throughout the United States. We invite you to view 50 Plus News Magazine articles as well as additional information on this website, and to register so you may comment on articles and blog posts. In addition to our monthly newspapers, we publish, print and offer online resource guides and present free 50+ Expo events. Information about these can also be found on this site. Simply click on the buttons at the top of each page. We also welcome you to contact us for more information. We publish both print and online resource guides, offering listings of government and nonprofit agencies, medical specialists, and businesses providing information and services for people 50 and over and their families. Each year, we print and distribute free of charge 25,000 copies of a comprehensive directory called the 50 Plus Resource Guide published in April in conjunction with our spring expo. This full-color, glossy directory contains more than 1,000 listings of county resources as well as advertisements from local businesses and nonprofits. On this website, we also provide a growing online resource guide, The 50 Plus List is searchable by topic, location or name. It contains all listings from the 50 Plus Resource Guide, and is being expanded to include similar resources throughout southeastern Wisconsin adding Jefferson, Racine, Kenosha, Dodge and Walworth counties. To search the 50 Plus List online resource guide, click here, or on Resource Guide at the top of the page. To advertise in the printed guide, be included in the online guide, please visit the section for advertisers. Copyright © 2016 50 Plus News Magazine..